We’d love your help. Let us know what’s wrong with this preview of Wolf by the Ears by Lexi Revellian. When Tyger Rebel Thomson starts working for a Russian oligarch, she could be on her way to the life of her dreams – assuming, that is, she lives long enough to get there. Grisha Markovic is a man with enemies. He’s loathed by the Kremlin, under observation by MI6, involved in acrimonious litigation over a Siberian gold mine, and rumoured to possess an explosive dossier cont When Tyger Rebel Thomson starts working for a Russian oligarch, she could be on her way to the life of her dreams – assuming, that is, she lives long enough to get there. Grisha Markovic is a man with enemies. He’s loathed by the Kremlin, under observation by MI6, involved in acrimonious litigation over a Siberian gold mine, and rumoured to possess an explosive dossier containing details of a massive Russian tax fraud. 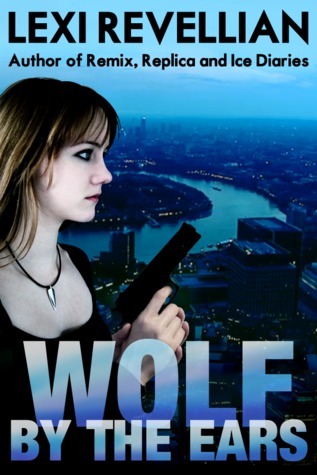 To ask other readers questions about Wolf by the Ears, please sign up. Some authors spend their whole careers writing the same book over and over. The names and plot twists and setting may vary, but readers know exactly what to expect. Lexi Revellian is not that kind of author. A new book is always a magical mystery tour. Will it be fantasy? Or maybe sci-fi? Will there be a murder or a kidnapping? But some things stay the same. There’s always a romance simmering. There’s always action and excitement and a heroine who falls into the normal range of humanity instead Some authors spend their whole careers writing the same book over and over. The names and plot twists and setting may vary, but readers know exactly what to expect. Lexi Revellian is not that kind of author. A new book is always a magical mystery tour. Will it be fantasy? Or maybe sci-fi? Will there be a murder or a kidnapping? But some things stay the same. There’s always a romance simmering. There’s always action and excitement and a heroine who falls into the normal range of humanity instead of being some super-badass weapon-wielding superwoman. And invariably they keep me totally hooked and put a great big smile on my face. Is it any wonder that a new Revellian book goes straight to the top of my to-read pile? This one features wealthy Russian emigrants with secrets (the word ‘oligarch’ crops up a lot) and political tension and even spies and secret dossiers. Our heroine, Tyger, is the daughter of wandering hippies (which you could probably guess from the name) who missed out on a formal education, but is now determined to get a degree and a respectable job. So she cleans houses by day, pulls pints in a bar by night and studies for the Open University in what little spare time she has. Her latest cleaning job sees her working for Russian oligarch Grisha Markovic, but one day she arrives at work only to be held at gunpoint by a hooded man who forces her to unlock the doors and show him to Grisha’s room. And things go steadily downhill from there. I liked Tyger very much. She’s practical and intelligent, she doesn’t take stupidly implausible risks, and she reacts to the increasingly worrying events around her in sensible and believable ways. Her not-really-a-boyfriend Kes is not quite so well-drawn, but then he doesn’t get so much screen time. The minor characters all seem very real, with distinctive personalities: Izzie the flirty barmaid, Chrissie the pernickety flatmate, Rose the hoarder, even Cherie the trapeze artist, a trivial walk-on part. It takes real writing talent to create characters that live and breathe and are still memorable when the book is finished. I did wonder how accurate the Russians’ distinctive accent was, but it sounded quite believable to me. There was quite a lot of political backstory to squeeze in, and the author has clearly done her research; occasionally I felt I could have done with fewer details about Anglo-Russian relations or circuses or motorhome interiors, but that’s a very minor quibble. The London setting was brought vividly to life; and who would have thought there was a bathing pool for ladies only? The plot raced along, and kept me turning the pages. However, despite the gun-in-hand cover picture, and the spies and bad-boy Russians theme, this never turned into one of those action-at-all-costs thrillers. This is a gentler, less violent (and much more realistic) version. There were plenty of dramatic moments, but in between life went on more-or-less as normal in a thoroughly British way. Some characters that I was sure were villains turned out not to be. Characters I thought might get bumped off survived. And always there was a patina of subtle humour which kept me chuckling. This book was surprisingly quiet and low key for a story about the Russian Mafia and MI6. But was it really about that? Or was it about a young woman finding her place in the world? The protagonist Tyger works as a cleaner for the Russian oligarch Grisha. All she wants is to get education, save for a small flat of her own, and get a good job. But then the job of Grisha’s assistant falls in her lap, and with it all the attendant perils and perks. When six weeks later, Grisha dies, purportedly fro This book was surprisingly quiet and low key for a story about the Russian Mafia and MI6. But was it really about that? Or was it about a young woman finding her place in the world? When six weeks later, Grisha dies, purportedly from a heart attack, Tyger doesn’t believe it. She knows he was targeted by the Russian government. It must be an assassination. When no one wants to bother investigating his death, Tyger is the only one who persists. While for everyone else he was a super-rich and ruthless businessman, for her he was a nice old man and a good employer. He was kind to her, and in return, she mourns him, seemingly the only one who does. She wouldn’t let his death go unpunished, even if it means risking her own life. Not a bad addition to the ‘amateur PI’ book collection. I’d also like to point out that for a self-published book, the writing was amazingly clean and terse, free of mistakes, utterly professional. One of the best self-pubs I’ve read. I’ve enjoyed all Lexi Revellian’s books. I like the way they’re all different. This was a slow-burn but I’m glad I stuck with it. I was rooting for Tyger from the beginning and the resolution was satisfying. I think I’d enjoy a sequel. I’m curious about the job offer and the adventures it might lead her into. Good fun. Recommendations do work! Her first book was recommended by my sister, and I’ve been hooked on Lexi’s stories since. This is the 4th of her books and it’s an interesting tale of a young woman who learns trust in the oddest places, and also finds out how far she will go to protect her friends. Rebel is struggling to make ends meet and get a degree so she can get a better job. She saves the day for a Russian mogul and gets her first break. But can she trust him not to be the evil pretender that othe Recommendations do work! Her first book was recommended by my sister, and I’ve been hooked on Lexi’s stories since. This is the 4th of her books and it’s an interesting tale of a young woman who learns trust in the oddest places, and also finds out how far she will go to protect her friends. Rebel is struggling to make ends meet and get a degree so she can get a better job. She saves the day for a Russian mogul and gets her first break. But can she trust him not to be the evil pretender that others say he is? She finds out that loyalty isn’t always blind and if people aren’t what they seem, it doesn’t mean they are the bad guy. I've now read most of the novels by this author-- this one was not my favorite but was enjoyable. Quick and entertaining read. I don't really write reviews, not my thing so forgive me- this is not a very well thought out review! I enjoyed Ice Diaries, Remix and Replica- I'd recommend reading those before this one. This one had a few surprises, and I liked the main character, Tyger. Being an Anglophile, I really enjoy stories set in England. Intriguing mystery about a young ambitious traveler woman who finds herself involved in London's ex-patriot Russian community. Once again, the author presents a strong relatable character and an engaging premise with plenty of twists and turns. Loved the London atmosphere and authentic Russian dialect. Revellian's books are not great literature, but a good story with a strong female lead and a satisfying wrap up. I'm always happy when she releases a new book because while I don't know where she's taking me, its going to be a good ride.